The force gauge Centor Touch Dual R series have all the functions of a Centor Touch STAR R force gauge. And thanks to its ability to read two sensors simultaneously with a 5000 Hertz sampling rate per chanel, the force gauge Centor Dual is a true test console. It offers all of the functionality of an efficient force gauge, its calculating power enables it to save values from two different sensors simultaneously, to monitor set points and to perform calculations on each channel. Easily swap load cells, thanks to its advanced features - you can swap load cells by symply disconnecting one cell and fitting another. When a new loadcell has been connected, the Centor Touch Dual will automatically recognised it (reading the new cell's range, serial number and calibration status). Available cells: force / Torque / rotational displacement / Linear displacement. 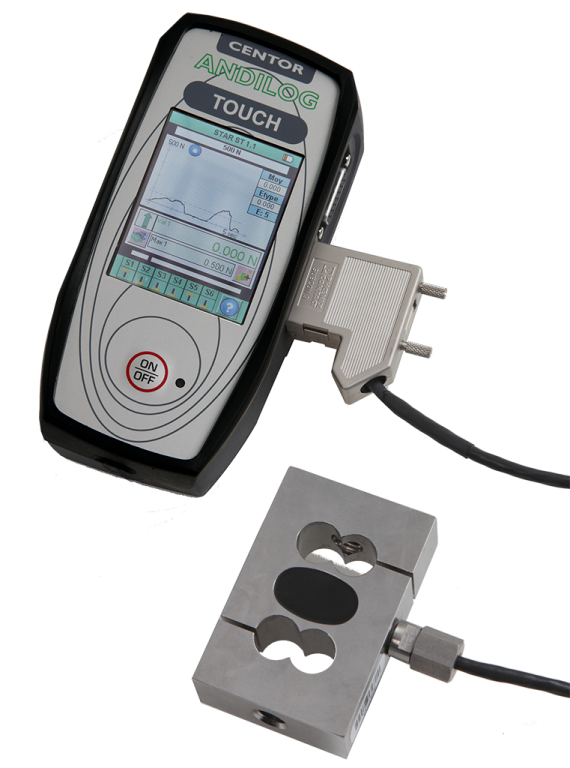 For high capacities, when the measuring space is small or to integrate the load cell in a system, our force gauges Centor Touch Dual can be mounted with an external load cell to fit your needs. It is the simplest and most complete scalable system for approaching the most diverse and thorough tests in a workshop or laboratory.